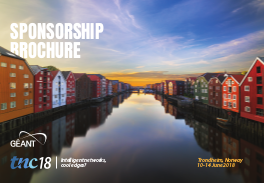 Please note: Due to the high interest in TNC18 sponsorship we regret to inform all prospective sponsors that all the exhibition space is now sold out. Ciena is a network strategy and technology company with a unique ability to translate best-in-class technology into value through a high-touch consultative business model. We believe in driving an industry ecosystem and offering the greatest degree of flexibility in how our customers consume technology to deliver the most rewarding experiences and business outcomes. We develop and apply technologies across packet and optical networking, and distributed software automation that drive openness, virtualization and unprecedented network adaptability. Ciena partners with customers to build the Adaptive Network, tackling complexity by combining intelligent automation, real-time performance data, and the ability to continuously tune the network to respond to changing bandwidth demands. ECI delivers elastic network solutions globally to CSPs, utilities as well as data center operators. Along with its long standing, industry proven packet optical transport, ECI offers a variety of SDN/NFV applications, a comprehensive cyber security solution and a range of professional services. ECI's ELASTIC solutions ensure open, future-proof, and secure communications. With ECI, customers have the luxury of choosing a network which can be tailor made to their needs today – while being flexible enough to evolve with their changing needs in the future. At ECI, customer success is our success. For more information, please visit us at www.ecitele.com. Google is proud to collaborate with GÉANT and the NREN communities at the TNC flagship conference this year in Trondheim. Google Cloud is committed to Research and Higher Education across Europe and we believe in growing partnerships and building opportunities with universities and research organisations across the region. We are passionate about working with this community to push the boundaries of what is possible in the education sector. Microsoft enables digital transformation for the era of an intelligent cloud and an intelligent edge. Our mission is to empower every person and every organization on the planet to achieve more. We are delighted to be a Platinum sponsor at the TNC Conference 2018. Come to visit us at TNC where you can learn more about how Microsoft Azure has enabled researchers to accelerate their discoveries. Learn more about how Microsoft Azure services offer agility, flexibility, and scalability, while simultaneously ensuring privacy, security, compliance, and the ability to maximise resource utilisation for IT departments to deliver maximum value for Universities and Educational Institutions. Learn more about Microsoft Azure here and find out more about how Microsoft Azure can be procured through the GÉANT Framework here. Juniper Networks exist to solve the world’s most difficult problems in networking technology. We bring simplicity to networking with products, solutions, and services that connect the world. A company of innovators, we believe that creating simplicity through engineering is the highest form of innovation. From our first release, the ground-breaking M40 router, to today’s end-to-end advancements in network security, automation, performance, and scale, our drive to move beyond the constraints of complexity has expanded the reach of networks everywhere. We’ve enabled our customers to connect to everything and empower everyone in ways that have literally changed the world. In the profusion of new technologies such as IoT, big data, and multicloud, complexity is the new hard problem. And complexity is on the wrong side of progress. With the strength of our resolve, we’ll champion the evolution of the cloud and once again change the world. Simple is our obsession. Simple is powerful. And simple always starts with engineering. Atea is the leading Nordic and Baltic solution provider of IT infrastructure with approximately 6,900 employees. Atea is present in 87 cities in Norway, Sweden, Denmark, Finland, Lithuania, Latvia and Estonia. Atea delivers IT products from leading vendors and assists its customers with specialist competencies within IT infrastructure and cloud services. Atea has been selected as Microsoft’s approved reseller of Azure in 22 countries around Europe as part of the GÉANT IaaS Framework. Atea works with customers to manage the opportunities and challenges which cloud technology presents. Information technology becomes a source of inspiration and productivity, rather than a challenge to be managed. Corsa Technology is a networking infrastructure company delivering WAN-scale SDN networking and security equipment to ISP, SP, IX, CDNs, hosting providers and NREN customers worldwide. To enable innovative service offerings and programmable network security, Corsa SDN switching, routing, and mitigation equipment introduces forward-thinking features with programmable traffic management and line-rate per-flow forwarding at internet scale. In this era of Digital Transformation and Cloud, operational agility and efficiency are critical for maintaining competitive advantage. Extreme’s software-driven data center solutions are optimized to help Enterprise and Cloud organizations meet these challenges. Extreme’s pervasive network visibility and cross-domain network lifecycle automation intelligently automates provisioning, troubleshooting, and remediation of network infrastructure to eliminate network and cross-function service delays. Meanwhile, Extreme adaptive ASIC platforms deliver continuous value today and for years to come. Extreme’s agile data center solutions enable organizations to break from the status quo and build stronger relationships with customers and partners to deliver better business outcomes. Quit struggling with keeping hundreds of transceivers in stock for for all your different system vendors and benefit from our range of over 150 vendor compatibilities on our hardware platform. For network builders around the globe this combination of Universal Transceivers and the unrivaled FLEXBOX transceiver programmer makes their lives easier. No more hassle during the deployment and operation of both heterogeneous & single vendor system environments. FLEXOPTIX is a technology provider for hardware and software based in Germany. We at FLEXOPTIX like things, which just work. Daily work with all its challenges is complex enough – we try to simplify and enhance where we can. The Internet Society (ISOC) supports the development of the Internet as a global technical infrastructure, a resource to enrich people's lives, and a force for good in society. Working through a global community of chapters and members, the Internet Society collaborates with a broad range of groups to promote the technologies that keep the Internet safe and secure. We advocated for policies that enable universal access to an open and trusted Internet. Together, we focus on: - Building and supporting the communities that make the Internet work; - Advancing the development and application of Internet infrastructure, technologies, and open standards; - Advocating for policy that is consistent with our view of the Internet. PIONIER is the Polish national research and education network created to provide high-speed Internet access and to conduct network-based research. PIONIER network represents a base for research and development in the area of information technology and telecommunications, computing sciences, applications and services for the Information Society, includingsuch areas of interest as: radio astronomy, medicine, new media, knowledge platforms and digital libraries, applications of grand challenges, cyber security or Future Internet technologies. Poznan Supercomputing and Networking Center (PSNC) is the operator of the PIONIER network directly connecting Poland with the pan -European GÉANT network. The RIPE NCC is the Regional Internet Registry for Europe, the Middle East and parts of Central Asia. As such, we allocate and register blocks of Internet number resources to Internet service providers (ISPs) and other organisations. We’re a not-for-profit organisation that works to support the RIPE (Réseaux IP Européens) community and the wider Internet community. The RIPE NCC membership consists mainly of Internet service providers, telecommunication organisations and large corporations. GÉANT is a membership organisation acting with and for its members to further research and education networking in Europe and globally. It serves the research and education networking community in Europe, helping them to deliver innovative networks, technologies and services for research and education. GÉANT is also the leading collaboration on network and related infrastructure and services for the benefit of research and education, contributing to Europe's economic growth and competitiveness. The organization mobilises the expertise and experience of hundreds of professionals from among its staff, member organisations, institutions and the wider research and education networking community. Uninett runs and develops Norway's research and education network (NREN), connecting more than 300 000 users cross-country. Uninett is owned by the Norwegian Ministry of Education and Research. We are a neutral party, and the business is run non-profit. The European Commission's Horizon 2020 is the biggest EU Research and Innovation programme ever with nearly €80 billion of funding available over 7 years (2014 to 2020) – in addition to the private investment that this money will attract. It promises more breakthroughs, discoveries and world-firsts by taking great ideas from the lab to the market.